I approached reading Coming of Age: Growing Up Muslim in Australia with interest and anticipation, but little expectation that I would personally connect with the stories it contained. I left childhood and teenage years behind some time ago and I am not Muslim, nor do I have any close friends who practice this faith or have it as part of their cultural heritage. I started reading the memoir-style accounts in the book with the expectation of reading about experiences that were somehow distinctly separate to my own. Instead, I found a book that echoed so many of my memories of being a teenager – the emotional highs and lows, the questions about identity and purpose, the increased influence and importance of friends, self-consciousness about appearance and the shifting of family dynamics. The twelve moving and powerful personal accounts within the book share emotions, conflicts, goals and insecurities that anyone who has passed through the transition from childhood to adulthood (and those still in the process) will readily relate to. The various contributors discuss their experiences regarding body image, career, faith, family, friendship, bullying, peer pressure, sexuality, gender, relationships and self-esteem as well as the challenges of growing up Muslim in multicultural Australia. 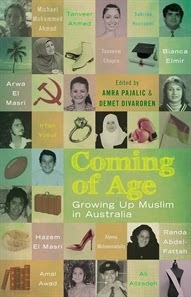 Coming of Age offers readers a multifaceted and dynamic picture of the Muslim experience in Australia. Insights about the everyday practice of the Muslim faith for the contributors revealed a diversity of approaches within Islam, just as there are within so many other faiths, and a diversity of national and ethnic cultures that also played a significant role in how they dealt with the many physical, emotional and social challenges of teen years. The contributors come from a variety of ethnic backgrounds including Indian, Lebanese, Palestinian, Pakistani, Bangladeshi, Iranian and Egyptian. They are both male and female, and reflect a variety of lifestyles, careers and religious viewpoints. There are accounts by a beauty queen, female kickboxer, rugby league star, writer, lawyer, atheist, lesbian and more. Editors Demet Divaroren and Amra Pajalic have collected together a series of personal accounts that not only reflect the experiences of Muslim teens in Australia, but also highlight the tension experienced by many teens as they struggle to balance their growing desire for independence and autonomy with a need to remain connected with their family and heritage as they go through a stage of life where they are redefining expectations, re-evaluating their identity and finding new ways to relate to their family, friends and environment. I was incredibly touched by the heartfelt stories shared by the various contributors, who include Randa Abdel-Fattah, Hazem El Masri, Bianca Elmir and Michael Mohammed Ahmad. I think that this book should be read by all Australian teens and adults, not only because it helps to break down cultural stereotypes, but also because it serves as a meaningful and thought-provoking reminder of how much we have in common and the challenges faced by our young people as they pass through their teen years. For teens particularly, it conveys the message that they are not alone. While they may have something that makes them feel distinct and ‘different’ from those around them, there is so much of the transition to adulthood that is common to all. Coming of Age: Growing up Muslim in Australia is a collection of real stories by real people that is incredibly relatable and readable. The stories it shares will strike a chord with readers from all cultural backgrounds and faiths and in a social climate where so many are inclined to focus on the few things that divide us, it is a welcome reminder of how much we all have in common.